The power, in simple terms, is ‘rate or speed of doing work’. The work is defined as a 'force operating thru' a distance'. The automotive engines use the term 'horse power' (hp) to measure its power. This term comes from the erstwhile practice of measuring the rate of work done by a horse which equals to 33,000 ft-lb of 'work done' per minute. A conventional engine produces its power by burning the fuel. The combustion process releases the heat energy which results in the generation of expanding forces known as power. The engine’s power is commonly measured in Brake-Horse-Power (bhp), Pferdestärke (PS) which is the German translation of horsepower. Metric system uses kilowatt (kW) unit of measurement while in the case of the imperial/British system, it is 'feet-pound-force-per-second' (fps). Engine loses some of its generated power while overcoming its own friction known as 'Frictional Horse Power'. 'Indicated Horse power' is the actual power developed by the engine whereas Brake Horse Power is the available power which is almost about 70 to 85 % of the actual power developed inside the engine. You can also calculate the power output, if you know the torque value & engine rpm by the following formula. Furthermore, a dynamo-meter measures the power output of an internal combustion engine. Most automotive engines produce power in a wide band of the engine’s speed. Although the power output varies from engines to engines, it is characteristically highest at the top-end of the engine’s rpm range. The power output of an engine is usually represented in the graph as a curve against the engine rpm band. Incidentally, Bugatti Veyron is one of the most powerful cars in the world. How does horse power help? 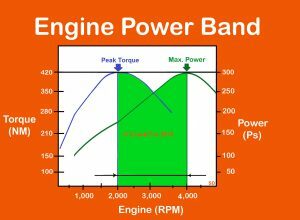 The power curve in an engine represents its rate of doing work corresponding to engine’s rpm band. Higher the power an engine can produce means that it can do more work OR give higher performance. Thus to achieve higher vehicle speeds, you need more power. Power is most useful while speeding & overtaking. The vehicle often needs more power when it is climbing a gradient as the engine has to pull the vehicle’s weight against the forces of gravity. What is the engine ‘Power-Band’? Theoretically, the engine speed range between ‘peak-torque’ rpm and ‘max-horse power’ rpm is known as ‘Power-Band’. It is the range in which the engine is most efficient & gives the best performance. Remember, the fuel consumption increases with engine speed. But, it is lowest within the engine’s ‘Power-Band’. Hence, always know the ‘power-band’ of your engine. If you change the gears within the ‘power-band’, you are likely to get the best fuel efficiency from your vehicle. So, read the ‘Engine Specifications’ in the Owner’s Manual to know about the ‘power-band’ of your engine. (Note: This range varies from vehicle to vehicle). Which factors affect the engine’s horse power? Fuel delivery methods – Carburettor, MPFi / GDI / CRDi etc. How to use the engine’s horse power effectively? Moreover, the engine horse power can best be used in collaboration with the engine’s torque and thereby changing the gears accordingly. To get more speed, you need more power. And to get more power, you need to burn more fuel. Besides, a conventional engine produces more power at the cost of higher fuel consumption. Every engine reaches its Max. Power value when you rev it to the full throttle before the ECU cuts off its fuel supply. So, manufacturers mention this value in the Owner's Manual under the ‘engine specifications’. For e.g. 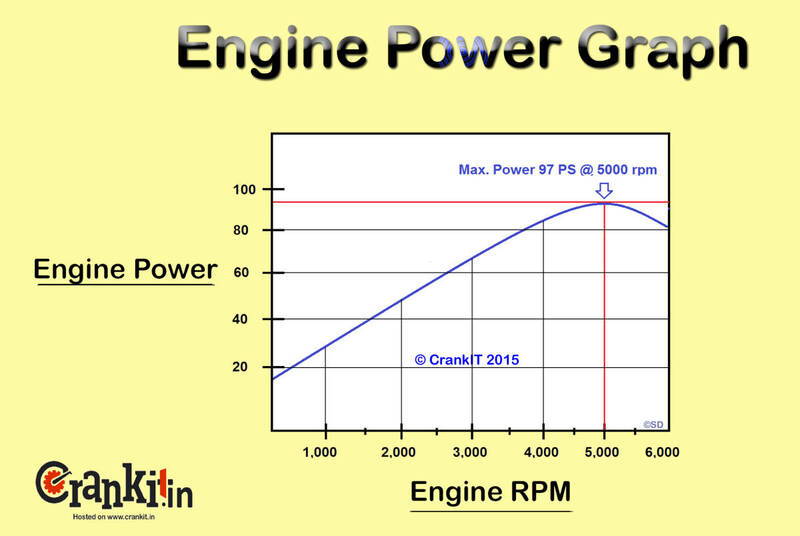 ‘Maximum Power: 97 bhp at 5000 rpm’ as shown in the 2nd diagram (Engine Power Graph). You need maximum power to spin the engine faster when speeding or overtaking. However, while cruising on a plain road/motorway you need not run the engine at max. power/rpm. Remember, running the engine at maximum rpm will only result in the burning of additional fuel. So, use the accelerator sparingly to control the engine power and get the best efficiency out of it.…!!! 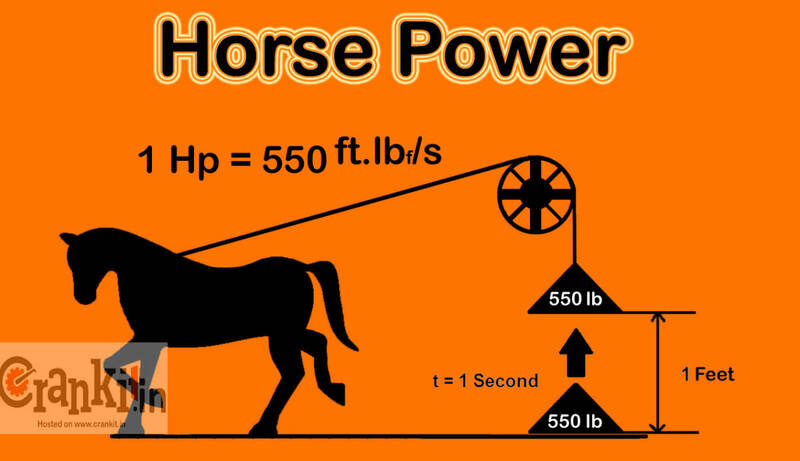 Home » Technical Anatomy » What is Horse Power? How to calculate & use it effectively? What is ride by wire technology in bikes? How it works?